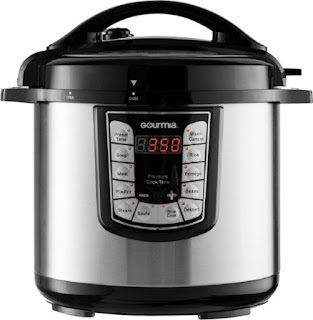 Today only, while supplies last, get this Gourmia - 8-Quart Pressure Cooker for ONLY $49.99 (Retail $99.99)! Prepare favorite foods quickly and efficiently with this Gourmia pressure cooker. Its 13 cooking modes let you create a variety of dishes, and the auto-locking lid protects against burns and spills. The 24-hour delay and auto timer of this Gourmia pressure cooker let you program meals to start cooking at a specified time.